Israeli soldiers abducted, late on Saturday at night, a young man from Tubas city, in northeastern West Bank, and invaded a home near Jenin, in northern West Bank, before confiscating cash from a home of a political prisoner in Qabatia town, south of Jenin and caused many Palestinians to suffer the effects of teargas inhalation in Ya’bad nearby town. The Palestinian Prisoners’ Society (PPS) said the soldiers abducted Hasan Fares Daraghma, while crossing the al-Hamra military roadblock, and took him to an unknown destination. 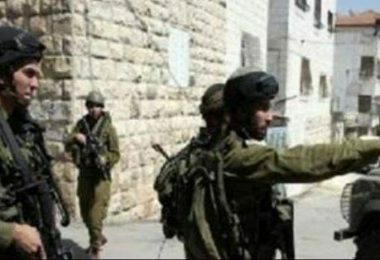 Furthermore, the soldiers invaded a home of a Palestinian political prisoner in Qabatia town, south of Jenin, and ransacked the property before illegally confiscating 1800 Jordanian Dinars. The family of detainee Mohammad Riyad Zakarna, said the soldiers violently searched the property, after breaking into it, and confiscated the cash. Furthermore, the soldiers invaded Ya’bad town, south of Jenin, and caused many Palestinians to suffer the effects of teargas inhalation.